Recently NeWay Logistics operated an Antonov-26 carrying 83 boxes with a payload of 1351 kilogram in total of valuable pharmaceuticals from Liege airport (LGG) in Belgium into Mitiga airport (MJI) in Libya. The cargo charter flight was operated on behalf of Cyber Freight International in the Netherlands. The pharmaceuticals had to be transported under strict temperature control to ensure the well being of this important shipment. Therefore the temperature was being measured from the moment the cargo was collected at the shipper’s facility, throughout the flight and finally at the handover of the cargo to the consignee in Mitiga in Libya. NeWay arranged cold storage at Liege Airport where the cargo was only taken out of the cooling less than one hour prior to departure. A dedicated staff of NeWay was at Liege Airport throughout the loading process in order to support the customer at any given moment. During the flight the temperature was constantly controlled between 2-8 Degrees Celsius. This sensitive cargo charter flight was operated successfully, the goods were transported accordingly and the valuable pharmaceuticals arrived at the receiving party in Libya in perfect condition. 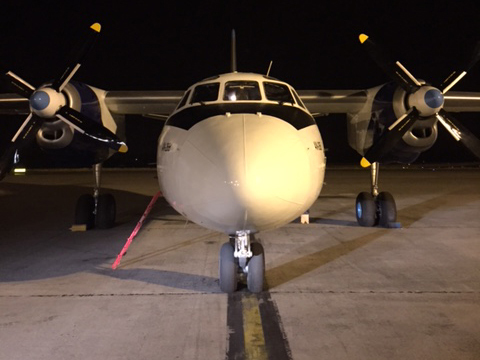 NeWay specializes in operating cargo charter flights into Libya both from Europe and from the Middle East. Besides operating the flights, NeWay also provides handling as well as fuel, permits and other kind of flight services for all airports in Libya. NeWay has set up an efficient network to deal with the challenging environment and operate flights sucessfully into Libya.